Grease twelve 2-1/2-inch muffin cups or line with paper bake cups; set aside. In a medium bowl, combine flour, sugar, baking powder and nutmeg. Make a well in center of flour mixture; set aside. In another bowl, combine eggs, eggnog, melted butter, vanilla and rum extract. Add egg mixture all at once to the flour mixture. Stir just until moistened (batter should be lumpy.) Spoon batter into prepared muffin cups, filling each two-thirds full. 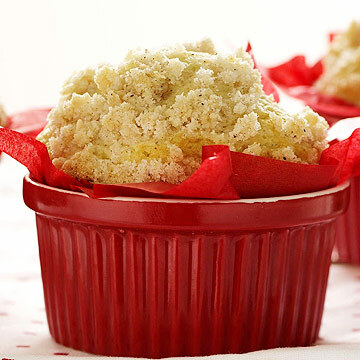 Sprinkle streusel topping over muffin batter in cups. In small bowl, mix flour, sugar and nutmeg using pastry blender. Cut in butter until the mixture resembles coarse crumbs.